Esri’s World Population Estimate, a new probability surface that estimates the location and count of people throughout the world, is now available in ArcGIS Online. Esri has been producing a global population estimate in ArcGIS Online for several years. This data is in the form of point features with population counts and characteristics assigned to each point; and it is used behind the scenes in apps such as Business Analyst Online, Community Analyst, and Esri Maps Apps. That may sound simple, but those points are big data; with nearly a billion locations represented. 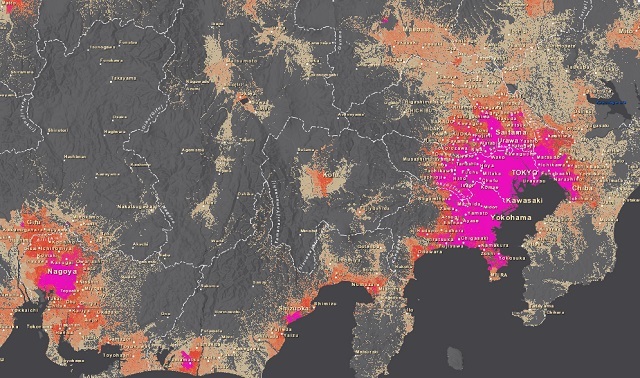 The Geographic Data Enrichment tools depend on those points as the basis for describing the characteristics of local populations in countries lacking a census or countries that do not make detailed census data available. World Population Estimate map for Jakarta, Indonesia. Based on this earlier point data work, Esri released the World Population Estimate (WPE) in December 2014. WPE takes the form of a raster surface, which is far easier to make available in ArcGIS Online and use in analysis models than the previous point data. Earl Nordstrand, a senior researcher at Esri, has been working on and refining the method for producing the WPE for several years. Nordstrand’s method uses data rather than the traditional approaches of sending census enumerators out to count people or estimates of economic activity as a surrogate for counting households or people. Nordstrand’s data includes satellite imagery for land cover from MDA’s NaturalVue, and he used a texture-detecting model to find the areas that are likely to have people. 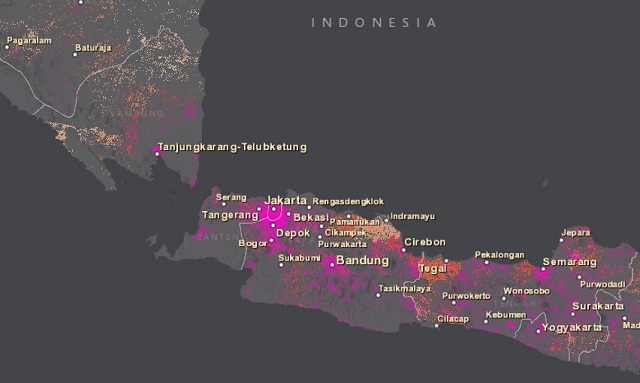 Because land cover data inherently includes information about where surface water, agriculture, and permanent ice, these can be eliminated, because there is a high level of certainty that people as a rule do not live in these locations. 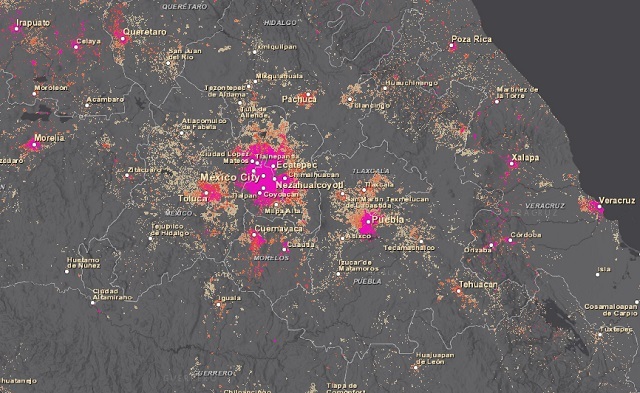 World Population Estimate map for Mexico City. By itself, this model does not produce a perfect result, so Nordstrand used other data like road intersections and extreme climates to increase the certainty of some locations while eliminating others. Place name points from GeoNames.org were also used; though this definitely improves the result, the hard part, according to Nordstrand, is these points do not indicate how large or spread out these places are. Nordstrand also used census data where it existed to calibrate and further refine where people were likely to be located. In some cases, this census data also inherently contained information about where people do not live, including locations of airports, industrial complexes, and the like. The WPE is based on input data that ranged in date from 1990 to 2013. The estimated number of people is 6.89 billion which is consistent with other estimates of the world’s population in 2013. Based on World Bank estimates, there are just over 129.7million square kilometers of land (this does not include inland water bodies or Antarctica, but does include extreme terrain such as mountains). The WPE shows that humans live on about 7.9% of this land area. The WPE shows that 55.48% of people live in urban areas, with concentrations of people over 2,500 persons per square kilometer, and that these urban areas only occupy about 0.56% of the earth’s surface. Yes, that means that over half the world’s population lives on less than 1% of the land area. Such proportions have been documented and available from the World Bank and other organizations for many years, and Nordstrand used them to verify that his model was producing valid results. World Population Estimate map for Tokyo, Japan. Ecology, where people are often the primary source of disturbance to naturally occurring ecosystems and habitats. Epidemiology, where people are either the primary vector for disease proliferation, or people are located in the path of a given a disease vector. Disaster Response and Recovery, where knowing the size of an impacted population allows for better management and planning. You can access the World Population Estimate today to support your own work and research. The WPE is available free to organization account users in ArcGIS Online and can be used throughout the ArcGIS Platform for visualization and analysis. Get started by following these links to explore the data, and to start using it online, in Desktop, or Pro. It is Esri’s hope that this new window into global population can be used to help us to better understand what 7.3 billion people on Earth means.